I know I shouldn’t do it, not until the ultimate proofread is in the bag. The reason I know that is because I did the same thing with the last book: Formatted everything neatly, and then did it all again after I’d made changes to the manuscript. My PDF is immaculate. Immaculate, but reversed. What the hell is that about? Everything in the right place, but on the wrong page. So my extra-wide margins for binding have become extra-wide thumb rests, and the page numbers should be on the outside edge of the page. Back to the drawing board (heavy sigh). My PC won’t save the downloads, according to my Kindle reader I’ve already got a copy. (‘Search Documents’ doesn’t agree.) And I’ve shot myself in the foot by writing two books with very similar names. After hours of this brain exercise, I’m not even sure I’ve uploaded the manuscripts which tally with their covers. 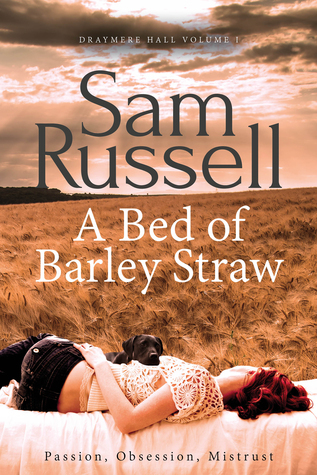 I mean, A Bed of… Barley? Or Brambles? Who’s daft idea was that? Luckily, it’s only a trial run. I’m honing my skills so that the real thing will be perfect. But my brain cells are knackered now, so I’m off for a frosty walk and some blue sky thinking. As an only child, Russ was an itinerant, a bolter. We have far too many feral temptations on the farm: The hedgehog in the paddock, the muntjac in the woods, deer that will run for miles when there’s a dog (and me) chasing them. And the postman’s red van, although our postman isn’t feral. He carries dog biscuits. He’s thinking of going here – note the firm grip. We hoped that having a friend would encourage him to stay home. Oh, the sweet naivety of that idea. We were about to encounter the full force of Border terrier itinerancy. What had been solo, forty-minute forays became twenty-four hours of canine sortie when they were hunting as a pack. And Meg was fast. No point in me running now (phew), all I could see was two brindle specks on the far, distant horizon. They never learnt recall. The best you might get was a contemptuous stare, and that was only if you were lucky enough to be within staring distance. I’ve spent many hours on torchlight hunts, untangled leads wrapped around branches, apologised to too many neighbours (and to the security men at the nearby science park, who caught them on CCTV. They were chasing the swans). I’ve retrieved those dogs from three different counties, but they usually turned up on the doormat after I’d spent the night sleepless with worry. Knackered, bloodied and bruised (that was them, I was just knackered), wearing mud-heavy clogs, their coats matted with our very own super-bonding clay, and frequently infested. Have you met seed ticks? The veterinary nurse at our practice hadn’t, she thought I was being hysterical. ‘Bring them in, we can sort that out.’ And she came at them armed with tweezers. Now seed ticks are not just your common or garden tick (I’ve tweezered off plenty of those little buggers. I recall that my best [or should that be worst] count was thirty-six ticks. Removed from a single dog, In one session). She can’t say I didn’t warn her, that nurse. Her face was a treat, and I can’t deny the thrill of satisfaction that gave me. We were, at last, united in hysteria. Hundreds, nay thousands, of miniscule black ticks. Like poppy seeds, but evil. The nurse put her tweezers away and sent me home with some Napalm. Tune in next time for episode three (My Dog’s Got no Nose). May blossom living up to its name, and cow parsley crowding the verges. …right in the middle of nowhere. How’s that for rustic romance. I can always edit tomorrow, it will give me something to do until I’m able to walk again.